Enter through the gates of this sublime jungle refuge and you will immediately notice the subtle power of nature begin to works its magic on you. 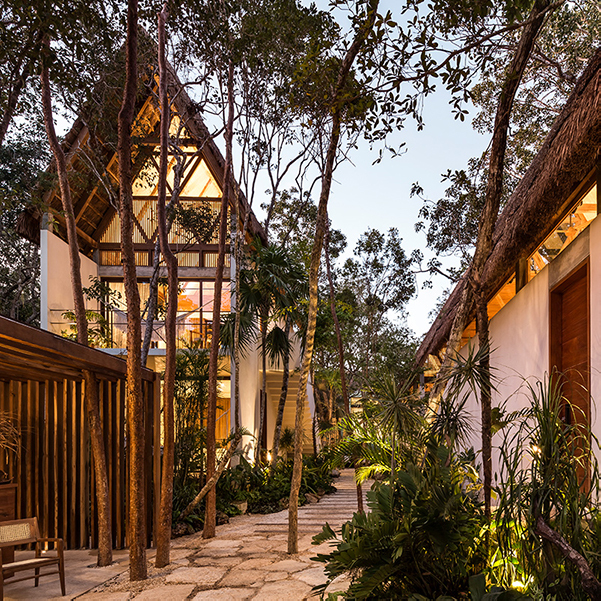 All five senses will stand to attention as you observe the impeccable infusion of the jungle’s essence into every single design element of Jungle Keva Tulum. Our goal since the inception of this concept has never altered. We determined to create this important project based on the offerings of the land. 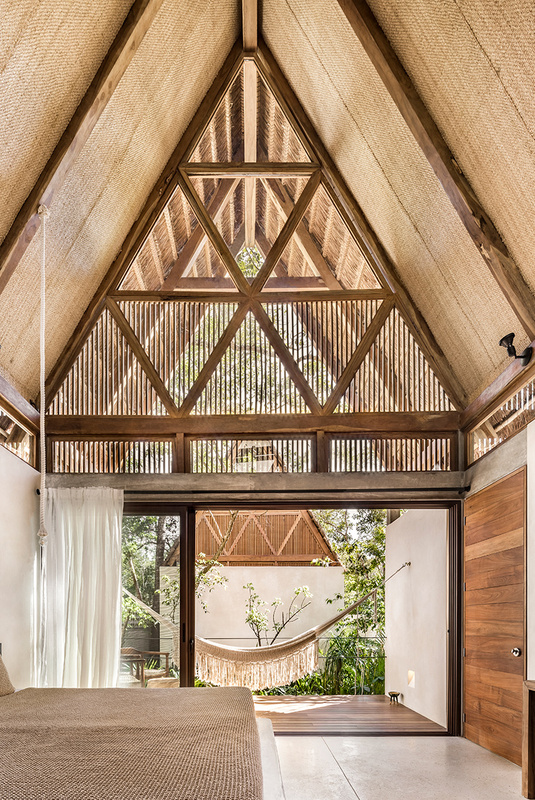 The main objectives were to first honor the environment, then to provide a nurturing and inspiring sanctuary that would allow individuals to connect back to themselves. From determining how to maximize energy and trade wind air flow to modifying the original plans for our infinity pool so as not to uproot ancient trees, our property capitalizes on the natural jungle feel. The result is a breath-taking and tranquil meditative space that we are proud to share with our valued clients. Five superb lodges offer ample space for retreats, while providing private, first-rate abodes for individual travelers, small groups and families. Our focus on restorative lodging embraces the extraordinary natural beauty of Tulum, as well as captures its signature stylish and relaxed vibe, presenting you with the perfect gateway to this award-winning destination. Included with your stay is a scrumptious warm breakfast with your choice of fresh-squeezed juice, coffee or Kendall’s famous Chai Tea. From our Jungle Keva Restaurant lunch and dinner menu, the exotic flavors of Mexico are further showcased in creative dishes made from superior quality ingredients and local organic produce. Begin the day with an invigorating yoga class each morning led by experienced instructors. After an adventurous day of scouting out Tulum’s long list of remarkable sites, unwind by the pristine infinity pool with a fabulous meal accompanied by top-notch live music. Practice Mysore Style Ashtanga Yoga each morning, with feedback, hands on assists, insights, and perspectives from 2 Mysore Style teachers, Jade Skinner and Calley Sunderman. Ready for an amazing vacation? Ever wanted to go to Tulum but didn't know how, when or what to do? Join me for my Fearless Tulum Escape Retreat! Looking to get away from it all this autumn? Consider booking a spot on this yoga retreat, which will take you to an enchanting jungle hideaway. Have an idea for a retreat idea, but need an enticing location? Owner and super host Kendall has over 15 years of experience organizing retreats in the United States and Mexico. She and her Jungle Keva Tulum team will partner with you to create a schedule of events guaranteed to awe and inspire your group. From wellness and personal development seminars to writing retreats and incentive reward trips for your top performing employees, your union with Jungle Keva is sure to be a successful crowd pleaser. 4 unique itinerary styles each give retreat guests an unforgettable lifetime experience in one of the most desirable travel destinations in the world. Guided local excursions offering a genuine taste of the region’s history, culture, and culinary offerings. Choose from a fun-filled excursion list, which includes expeditions to ancient Mayan ruins sites, sacred cenotes, remarkable underground caverns and scenic mangrove canals in a protected biosphere. Exceptional amenities and services including locally sourced menu options, a stunning yoga and social space, a gourmet kitchen, live music, and a pristine infinity pool.